There are profound intersections between the environmental humanities and the psychological obstacles to compassion. The book Numbers and Nerves: Information, Emotion, and Meaning in a World of Data (2015), which provided the original impetus for creating this website, focuses on several key psychological obstacles to awareness and sensitivity regarding mass atrocities, famine, climate change, the refugee crisis, and other major challenges in the world today—namely, psychic numbing, pseudoinefficacy, and the prominence effect. A second important dimension of Numbers and Nerves is the work of writers, photographers, and visual artists to communicate information about these and other crises in ways that surmount or sidestep the above-mentioned obstacles to compassion, pricking readers, listeners, and viewers and enabling us to pay attention to these phenomena and care about them rather than merely feeling detached and overwhelmed. People who study these communication strategies in the context of human connections to geography, animals, and physical processes (such as climate) work in the environmental humanities. The environmental humanities are a connected set of disciplines—such as ecocriticism, environmental history, environmental philosophy, and environmental religious studies—that offer powerful tools for understanding and responding to some of the greatest challenges we face in the world today, ranging from the humanitarian crises mentioned elsewhere on the Arithmetic of Compassion website to such ecological catastrophes as microplastic pollution of the planet’s seas and the mega-extinctions happening across the globe. Over the past several decades, tremendous effort has gone into understanding not only the ethical dimensions of human relationships to the planet, but many other humanistic dimensions of the so-called “ecological imagination.” Environmental humanities scholars have knit together the social movement known as environmental justice with the theoretical and historical insights of postcolonial studies to explore the historical and ongoing processes that damage both natural environments and human communities. Ecofeminism and multicultural environmentalism scrutinize and critique the connections between social hierarchies and environmental injustice, while also illustrating the roles of gender, sexuality, and culture in supporting distinctive ecological identities and knowledge, including Traditional Ecological Knowledge. Some environmental humanities scholars are committed to understanding multispecies relationships (animal subjectivities, companion species, and human actions toward other species), while others focus on environmental communication and information management. Perhaps this latter area of research is particularly germane to the Arithmetic of Compassion website. In 2011, author and literary scholar Rob Nixon published the book Slow Violence and the Environmentalism of the Poor. The concept of “slow violence” has since become one of the most frequently cited and applied concepts in the environmental humanities, and it is highly relevant to the arithmetic of compassion. Nixon defines slow violence early in his book as a term to describe “calamities that are slow and long lasting, calamities that patiently dispense their devastation while remaining outside our flickering attention spans—and outside the purview of a spectacle-driven media” (6). This reference to the foibles of our individual and collective attention spans suggests that if people only made an effort to attend to unspectacular crises, they would appreciate and act upon these situations, but it’s actually not so simple, as we learn from the psychological explanations on this website. Still, attending to these crises is an important first step. The structural, large-scale, and temporally extensive forms of violence that Nixon details in his book and that have since engaged numerous artists, journalists, and environmental humanities scholars are extremely difficult to represent textually and for the human mind to grasp. Nixon describes this as a predicament of “apprehension” at length, arguing that “to engage slow violence is to confront layered predicaments of apprehension: to apprehend—to arrest, or at least mitigate—often imperceptible threats requires rendering them apprehensible to the senses through the works of scientific and imaginative testimony” (14). Parts II and III Numbers and Nerves, devoted respectively to “Narrative, Analytical, and Visual Strategies for Prompting Sensitivity and Meaning” and “Interviews on the Communication of Numerical Information to the General Public,” are precisely linked to the challenge of apprehending and communicating various forms of slow violence, from genocide to deforestation to climate change. Many of the blog posts on this website, too, are efforts to employ the psychology of compassion as a means of helping readers apprehend current humanitarian and ecological crises. As we discuss in the Postscript to Numbers and Nerves, Nixon refers to a particular group of communicators as “writer-activists” because of their aim to transform “abstract information” about imperceptible crises “into viscerally, experientially meaningful discourse that might trigger in audiences the impulse to act individually or collectively” (Numbers and Nerves, 218–19). For Nixon, these writer-activists have the potential “to help us apprehend threats imaginatively that remain imperceptible to the senses, either because they are geographically remote, too vast or too minute in scale, or are played out across a time span that exceeds the instance of observation or even the physiological life of the human observer” (15). Often instances or processes of slow violence require technological prostheses (temperature gauges, satellite images, etc.) for humans to perceive them, and the readings from these gadgets take the form of quantitative data or technical models. Information about large phenomena, such as numbers of migrants or fluctuating populations of species, often takes the form of databases, which tend to offer minimal affective content—in fact, they are by design abstract and “rational.” Environmental humanities scholars such as Ursula K. Heise, in her book Imagining Extinction: The Cultural Meanings of Endangered Species (2016), seek to discern the subtle narrative and symbolic dimensions of seemingly abstract representations of population data. Other scholars, such as Mitchell Thomashow and Timothy Morton, have argued that vast, slow catastrophes are perceptible if we train ourselves to look for them. In Bringing the Biosphere Home: Learning to Perceive Global Environmental Change (2002), Thomashow asserts that “the threats and challenges of such problems as loss of biodiversity, global climate change, and habitat degradation can become more accessible and personal, to the body and the mind, so they are directly perceived and intrinsic to everyday awareness” (4). He offers numerous tools for “place-based perceptual ecology” (5). He also points out that “exemplary biospheric naturalists . . . hold in common . . . feelings of humility, praise, respect, and reverence for the grandeur of the biosphere. These qualities,” he continues, “are the foundations of compassion—an ethic of care for the fabric of biodiversity, for the whole Earth project, beyond the chauvinistic needs of the human species” (121). In essence, what Thomashow shares in his work—this particular book and others (and also on his website: www.mitchellthomashow.com)—is a platform for developing the mindfulness necessary for apprehending slow violence and natural processes. Although he focuses his discussion on perceiving ecological change, much of what he says can also be directed toward humanitarian crises and solutions. Along similar lines, Timothy Morton, in Hyperobjects: Philosophy and Ecology after the End of the World (2013), dismisses the idea that certain types of slow violence, such as global warming (he prefers this term to “climate change”), are remote and inaccessible. He writes: “I do not access hyperobjects across a distance, through some transparent medium. Hyperobjects are here, right here in my social and experiential space. Like faces pressed against a window, they leer at me menacingly: their very nearness is what menaces.” And he continues: “Not only do I fail to access hyperobjects at a distance, but it also becomes clearer with every passing day that ‘distance’ is only a psychic and ideological construct designed to protect me from the nearness of things” (27). The implication here is that phenomena such as global warming may not feel real or may not seem directly associated with our own actions in the world if they are thought to be far away and abstract. This same logic can be applied to social phenomena, such as poverty, racism, gender discrimination, and other problems, that may swirl around us every day, although we tell ourselves that these are issues from the news headlines that do not apply to us. As Morton states, “OBJECTS IN MIRROR ARE CLOSER THAN THEY MAY APPEAR” (27). The concept of slow violence, which is receiving so much attention in the environmental humanities, has clear relevance to the psychological conditions featured elsewhere on the Arithmetic of Compassion website. This is a condition of insensitivity to important phenomena, requiring thoughtful strategies of representation and communication, such as stories and images, in order to bring information to life and give it meaning. Heise, Ursula K. Imagining Extinction: The Cultural Meanings of Endangered Species. University of Chicago Press, 2016. Morton, Timothy. Hyperobjects: Philosophy and Ecology after the End of the World. University of Minnesota Press, 2013. Slovic, Scott, and Paul Slovic, eds. Numbers and Nerves: Information, Emotion, and Meaning in a World of Data. Oregon State University Press, 2015. Thomashow, Mitchell. Brining the Biosphere Home: Learning to Perceive Global Environmental Change. MIT Press, 2002. ﻿The concept of slow violence addresses the perceptual and communication challenges associated with phenomena that seem to exceed human scale in their size and pace (too small, too large, too rapid, too gradual to be perceived through human sensory capabilities). A related issue is that of emotional attachment or compassion. Even if we are guided to notice and comprehend on some level the physical and biological processes involved in anthropogenic climate change and mass extinction that exceed the “background extinction rate” (Kolbert, 15), it is extremely difficult for human beings to summon enough emotional sensitivity to care about these and other phenomena. This is true in the environmental context, just as it is in the context of mass suffering among human beings. When writers like Elizabeth Kolbert use storytelling techniques that offer vivid settings, characters, and scenes as a way of representing complex, abstract phenomena such as “the sixth extinction,” they are counting on the power of narrative to evoke empathy among readers. The same process of producing empathy through story occurs when stories are shared in person or through film, personal testimony, and other media. In her 2007 book Empathy and the Novel, theorist Suzanne Keen cites the idea of “mirror neurons” developed by cognitive scientists as the reason why “readers feel empathy with (and sympathy for) fictional characters” (vii). Lisa Zunshine quotes social neuroscientists Tania Singer, Daniel Wolpert, and Christopher D. Frith in her Introduction to Cognitive Cultural Studies (2010): “[Mirror] neurons provide a neural mechanism that may be a critical component of imitation and our ability to represent the goals and intentions of others. . . . The growing interest in the phenomenon of empathy has led to the recent emergence of imaging studies investigating sympathetic or empathetic reactions in response to others making emotional facial expressions or telling sad versus neutral stories” (181). Zunshine emphasizes here that “our neural circuits are powerfully attuned to the presence, behavior, and emotional display of other members of our species” (118). In her overview of narrative empathy for the living handbook of narratology (2013), Suzanne Keen defines this cognitive phenomenon broadly enough to include the possibility that audiences can be moved by narrative discourse to attach themselves to any phenomenon or phenomena that might be depicted effectively through story. She defines narrative empathy as “the shared feeling and perspective-taking induced by reading, viewing, hearing, or imagining narratives of another’s situation and condition” (living handbook). Thus when Elizabeth Kolbert aspires to drive home the emotional meaning of extinction in the opening chapter of The Sixth Extinction (2014), she does so by telling the story of a scientist named Edgardo Griffith in the jungle of central Panama, who brings “two tiny blue-bellied poison frogs” back to the lab after a nighttime expedition, and it occurs to the author “that the frogs and their progeny, if they had any, would never again touch the floor of the rainforest but would live out their days in disinfected glass tanks” (22). The poignancy of a vanishingly rare species existing only in the exilic realm of a disinfected laboratory touches us in a way that that might not happen if we merely heard one of Kolbert’s expert informants state that a mass extinction is a process that will kill off a “significant proportion of the world’s biota in a geologically insignificant amount of time” (16). Other writers have sought to evoke empathy, through story-like language, for inanimate phenomena and, by extension, to attach emotional meaning even to slowly violent processes (or hyperobjects) such as a changing, warming planet, as Marybeth Holleman does in her poem “How to Grieve a Glacier,” beginning her 2018 work with the lines: “It’s not something you can hold in your arms. / You can’t rock with its image in a blanket / and keen away the nearing pain” (441). Recent studies of empathy and emotion in the context of the environmental humanities include Jennifer Ladino’s monograph Memorials Matter: Emotion, Environment, and Public Memory at American Historical Sites (2019) and her coedited volume, with Kyle Bladow, Affective Ecocriticism: Emotion, Embodiment, Environment (2018). Storytellers, narratologists, and others working in the environmental humanities and similar branches of cultural studies find themselves asking questions such as the following: What kinds of stories are particularly effective in evoking an audience’s compassion? Are all stories equally effective? Is it possible to represent a large-scale issue by way of a particularized story? Can narrative discourse be pliable to demonstrate trans-scalar thinking and can exposure to a trans-scalar narrative teach audiences to apply such thinking to information routinely received through the media? Bladow, Kyle, and Jennifer Ladino, eds. Affective Ecocriticism: Emotion, Embodiment, Environment. University of Nebraska Press, 2018. Herman, David. “Storyworld.” In Routledge Encyclopedia of Narrative Theory, edited by David Herman, Manfred John, and Marie-Laure Ryan. Routledge, 2005. 569-70. Holleman, Marybeth. “How to Grieve a Glacier.” ISLE: Interdisciplinary Studies in Literature and Environment 25.2 (Spring 2018): 441-42. James, Erin. The Storyworld Accord: Econarratology and Postcolonial Narratives. University of Nebraska Press, 2015. Ladino, Jennifer. Memorials Matter: Emotion, Environment, and Public Memory at American Historical Sites. University of Nevada Press, 2019. Lehtimäki, Markku. “Narrative Communication in Environmental Fiction: Cognitive and Rhetorical Approaches.” In The Routledge Handbook of Ecocriticism and Environmental Communication, edited by Scott Slovic, Swarnalatha Rangarajan, and Vidya Sarveswaran. Routledge, 2019. 84–97. Singer, Tania, Daniel Wolpert, and Christopher D. Frith. “Introduction: The Study of Social Interactions.” In The Neuroscience of Social Interactions: Decoding, Imitating, and Influencing the Actions of Others, edited by Christopher D. Frith and Daniel Wolpert. Oxford University Press, 2004. xiii-xxvii. Weik von Mossner, Alexa. 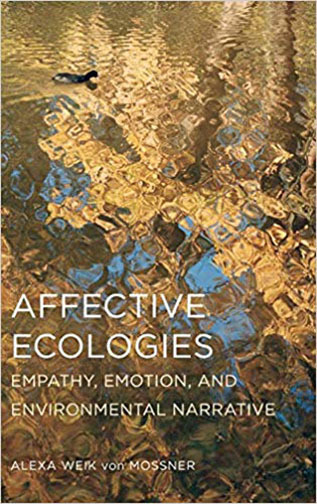 Affective Ecologies: Empathy, Emotion, and Environmental Narrative. Ohio State University Press, 2017. Zunshine, Lisa. Introduction to Cognitive Cultural Studies. The Johns Hopkins University Press, 2010. In the environmental humanities, there has long been a yearning to understand the “efficacy” of various forms of environmental expression. One of the earliest examples of such work is M. Jimmie Killingsworth and Jacqueline S. Palmer’s Ecospeak: Rhetoric and Environmental Politics in America (1992), which studies “the rhetoric of scientific activism,” “scientific discourse in the news media,” and “the rhetoric of sustainability,” among other practical issues related to the persuasive effectiveness of language. Carl G. Herndl and Stuart C. Brown’s Green Culture: Environmental Rhetoric in Contemporary America (1996) also helped chart the potential for rhetorical and ecocritical approaches to analyze and describe audiences’ (especially readers’) responses to particular types of environmental discourse. The Routledge Handbook of Environment and Communication (2015), edited by Anders Hansen and Robert Cox, provides an especially comprehensive introduction to the current state of environmental communication studies; the articles published there ask such practical questions as “What effects do different environmental sources (e.g., media) as well as specific communication practices have on audiences?” and “What are the relationships between or among communication, individuals’ values and beliefs, and their environmental behavior?” (Hansen and Cox, “Major Research Questions”). More recently, these and other questions have been pursued in a variety of media and diverse cultural contexts in The Routledge Handbook of Ecocriticism and Environmental Communication (2019), compiled by Scott Slovic, Swarnalatha Rangarajan, and Vidya Sarveswaran. With the advent of “cognitive narratology” in the 1990s (the term seems to have been used first by Manfred Jahn in the 1997 article “Frames, Preferences, and the Reading of Third-Person Narratives: Toward a Cognitive Narratology”), a new trend emerged in textual studies that brought together empirically researched theories of human cognition and the examination of specific kinds of language with an eye toward understanding how the structures of language might influence the thought patterns of audiences. In the contexts of humanitarian and environmental crises, Scott Slovic and Paul Slovic similarly began to apply empirically tested psychological theories concerning sensitivity and insensitivity to information—such as psychic numbing, pseudoinefficacy, and the prominence effect—in their commentaries on communication strategies presented in Numbers and Nerves (2015). Erin James and Alexa Weik von Mossner similarly transferred cognitive theories to the examination of specific works of literature and film in their books The Storyworld Accord (2015) and Affective Ecologies (2017). In 2018, Weik von Mossner joined Matthew Schneider-Mayerson and Wojciech Malecki in coordinating a new “empirical ecocriticism” initiative in the environmental humanities, building on existing work in cognitive narratology and econarratology and also extending the foundational work in environmental rhetoric and communication studies that began in the 1990s. This rapidly evolving branch of ecocriticism is described on the website empiricalecocriticism.com. The central goal of this work, as described on the website, is “to put to empirical test claims made within ecocriticism, and the environmental humanities more generally, about the impact of environmental narratives.” Researchers are currently developing various methodologies—many of them showcased for the first time at a December 2018 workshop hosted by the Rachel Carson Center at the University of Munich, Germany—that combine experimental design from the social sciences and textual analysis and description from the humanities. Recent works in this avant-garde field include such articles as Wojciech Malecki, Boguslaw Pawlowski, Piotr Sorokowski, and Anna Oleszkiewicz’s article “Feeling for Textual Animals: Narrative Empathy Across Species Lines” (November 2018) and Matthew Schneider-Mayerson’s “The Influence of Climate Fiction: An Empirical Survey of Readers” (2018). Given the humanitarian and ecological challenges we face in the world today, the work of social scientists and humanists, artists and activists, has taken on a new urgency. The empirical focus in ecocriticism and the environmental humanities more broadly emerges from this sense of urgency and the hope to offer practical contributions to the perceptual and communication challenges described elsewhere on the Arithmetic of Compassion website. Hansen, Anders, and Robert Cox, eds. The Routledge Handbook of Environment and Communication. Routledge, 2015. Herndl, Carl G., and Stuart C. Brown, eds. Green Culture:Environmental Rhetoric in Contemporary America. University of Wisconsin Press, 1996. Jahn, Manfred. “Frames, Preferences, and the Reading of Third-Person Narratives: Toward a Cognitive Narratology.” Poetics Today 18 (1997): 441-68. Killingsworth, M. Jimmie, and Jacqueline S. Palmer. Ecospeak: Rhetoric and Environmental Politics in America. Southern Illinois University Press, 1992. Schneider-Mayerson, Matthew. “The Influence of Climate Fiction: An Empirical Survey of Readers.” Environmental Humanities 10.2 (2018).